Traditional Okinawa handicrafts go on display this weekend at the 15th Okinawa Handicrafts Fair, with visitors having the opportunity to try their hand at touching and making some of the unique objects. Dozens of craftsmen and women will be exhibiting a wide range of traditional fabrics, including Ryukyu bingata, Kijoka area bashofu, Ryukyu kasuri, and Kumejima tsumugi, while others show off Miyakojima special joufu, Minser , Yonaguni, Shuri and Yomitan fabrics. There will also be exhibitions of Tsuboya pottery, Ryukyu lacquerware, Ryukyu glass, Tomishiro sugar cane dyeing and the Ryukyu indigo corner at the fair, which runs Saturday and Sunday at Okinawa Convention Center’s exhibition hall. 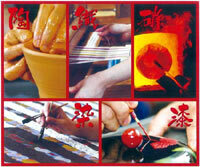 The Handicrafts Fair opens at 10 a.m. both days, closing at 7 p.m. on Saturday and 6 p.m. on Sunday. Fair organizers say there will be special performances, stage dancing and singing throughout the event. A drawing will take place during opening ceremonies Saturday, with the first 50 visitors receiving special certificates for traditional Okinawa products. 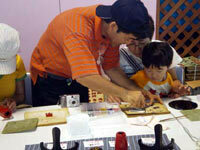 Opportunities for learning how to make traditional handicrafts are available throughout the fair. Included will be Ryukyu bingata, Ryukyu lacquer wares, Ryukyu kasuri and Ryukyu pottery. Other teaching and learning demonstrations will focus on floral handiwork tea ceremonies. A special handiwork experience section will be set up for parents and youngsters.